i am comfortable in my own skin, partly because nobody else would be. i am master of all i survey, though at present that amounts to a cardboard box, a digital compact camera and a copy of today's guardian. it is likely as it should be. there is a smug satisfaction in having a secret identity, even if everyone seems to know what that is. how come lois lane never figured out that superman was just clark kent without his glasses? it seemed so glaringly obvious to everyone else. i have, however, most thankfully stopped short at wearing my boxer shorts on the outside. variations on a theme are good. only the other day i was hurtling along roads constructed from neatly sewn together potholes, clad head to toe in cervo rosso's national pride jersey and bibshorts. you may have already read the review, in which case, you were hopefully as impressed as i. clothing such as that should really only be worn aboard high modulus carbon fibre; the fit, streamlining and flexibility were made for each other. you wouldn't go swimming in your levis (would you?). but then life is not all about polyacrylonitrile, polyester or lycra; sometimes even cycling life inhabits the more refined fibres bestowed upon us, such as the perennial favourite, merino. there is little or no contradiction between a swiss clothier's desire to live in the fast lane, yet keep at least one foot (or two sleeves) in the modern past. if that doesn't come across as too much of a contradiction (which it probably does). but in the tradition of a red rag to a bull the fine chaps at cervo rosso have categorised this excellent piece of merino craftware under the urban section of their online shop. i will readily admit to not exactly living in the middle of nowhere (that's the next street along), but the epithet urban is little used around these here parts, and i would not be surprised if the gaelic language were bereft of a word that could be used in its place. of course, words are mere shortcuts to the real thing, and just because carlyle figures that a merino cycle jersey is urban, doesn't mean to say that i, or the jersey agree. some similar style garments are all show and no go; designed to be worn in a relaxed manner, and to be used sparingly anywhere near a bicycle. not so in this case. but it's the urban that grates. glenegedale house sits opposite islay international airport. i'm unfortunately not well enough steeped in islay's heritage to let you know for why this large, stately building was originally built, but it is currently employed as a luxury guesthouse. on tuesday morning, around 10am, i was to meet with the proprietors for top-secret discussions. basically, i'm not telling you what i was there for, but suffice it to say that it had nothing whatsoever to do with cycling. however, cycling is the way that i travelled there. as stated, my appointment was at 10am, but with a current incongruous spell of sunny weather, i headed out early with the intention of at least a part of my cycle being surplus to requirements. 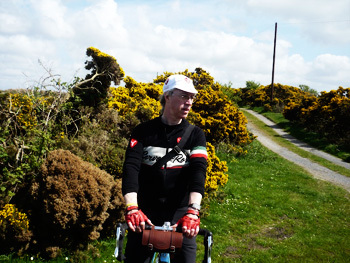 leather shoes, a pair of so-called urban shorts and the cervo rosso merino cycle jersey. three functional, buttoned rear pockets plus the zipped one missing from their race jersey; a full-length and chunky front zip that was an absolute doddle to open or close depending on internal warmth. a polyester jersey is not windproof. nor is merino. but the latter has a cosy, warm affectation in tow, and layered over a similarly constructed baselayer it is the equal of any chill you may care to throw in its direction. what i should perhaps have mentioned is that glenegedale house is almost midway between islay's two major villages; in the middle of nowhere. from where, on a clear day, the hills of rathlin and the coast of northern ireland can be seen in the distance. the middle of nowhere. not even remotely urban. i know, i was there. 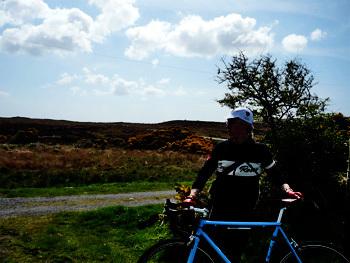 and unlike its more streamlined brethren, the merino jersey is far more discreet in a slightly ostentatious way. for the words cervo rosso are embroidered only once across the wide chest stripe bordered by a thin red line. front left chest and right sleeve bear sewn, embroidered cr logos. 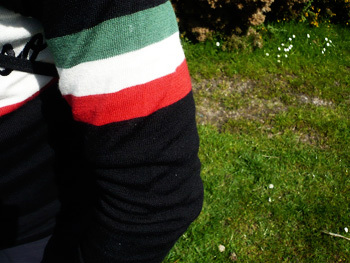 but the crowning glory, and worth at least an extra 3kph, is the italian tricolour on the left sleeve. 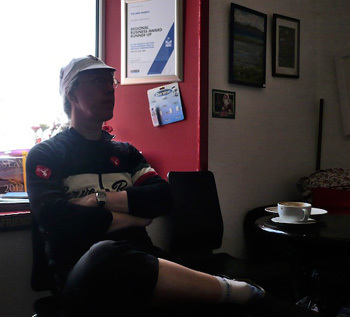 the giro is but nine days away. it's great, it's cool, it's stylish and it's currently on offer at £75. i dare you to think of a reason not to buy one.